Just about every year, I get a visit from a Hummingbird Clearwing Moth (Hemaris thysbe) feeding on the flowers in my planters. Host plants include cherry and plum - both which I have in my yard. Amazing to watch and always welcome! While in Savannah, Georgia last month for business, we had a short break in the meetings so I took a short walk along the canal bordering the hotel. And not more than 30 feet from me was this lurking American Alligator! He was a decent sized one - I'd say 5-6 feet long. Don't think I didn't make sure I could make a quick exit in case he thought I looked good for lunch! TAKE A BREATH, WILL YA?? Turn your speakers up for maximum chatter enjoyment! Red Admiral butterflies were plentiful in my yard today, enjoying the bright sunshine and spring blooms. They visited the plum tree and rhododendren bush that are just beginning to pop, but those flowers were far less popular than the nanking cherry (which is in full bloom but losing petals fast). They put on quite a show, but what I enjoyed most was seeing Red Admirals sharing the flowers with the bees. 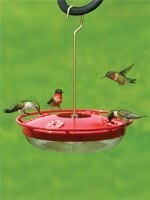 A baffle on your birdfeeding station pole will keep chipmunks from getting to your feeders. 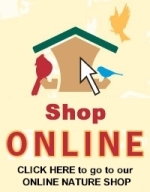 You can find baffles on our Wild Birds Unlimited online store.